Digital Earth 2025Will all commerce be ruled by Amazon, Walmart and Alibaba? Home » Uncategorized » How could Amazon, Walmart or Alibaba lead the world? How could Amazon, Walmart or Alibaba lead the world? The future is clarified by Walmart’s $3.3 billion acquisition of Jet.com, its large @WalmartLabs investments in Silicon Valley and Bengaluru, India, and its drive to catch up digitally before it loses this race. 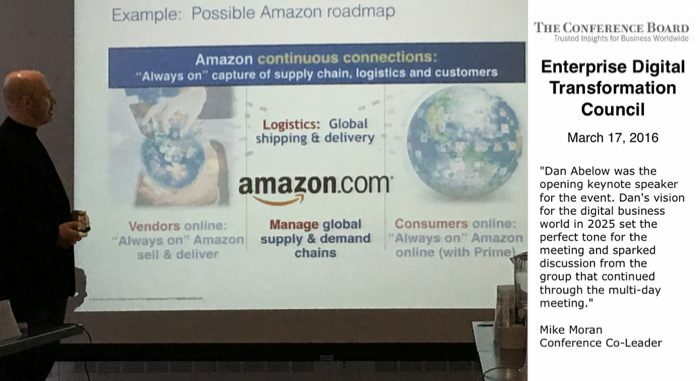 Dan Abelow, inventor of the Expandiverse, presents a possible Amazon World Leadership Roadmap to The Conference Board’s Enterprise Digital Transformation Council in New York. Share the post "How could Amazon, Walmart or Alibaba lead the world?"